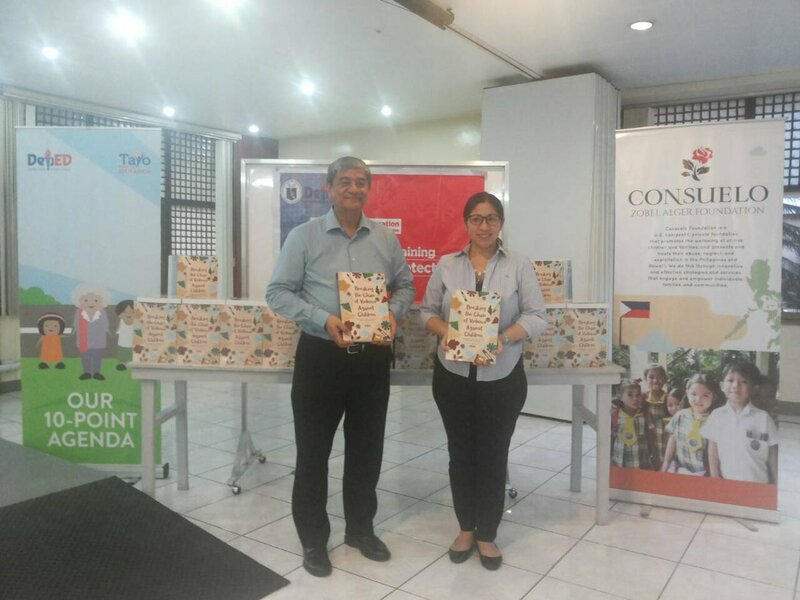 As part of its continuing efforts to promote the Child Protection Policy, the Department of Education (DepEd) received 1,500 copies of the manual entitled “Breaking the Chain of Violence Against Children: A Specialized Training Course for DepEd Child Protection Specialists” from Consuelo Zobel Alger Foundation on January 9. The donated training course manuals will be given to all the trained and designated child protection specialists (CPS) of DepEd, and will be used by the participants of the second level training, to help them gain expertise on providing technical advice and referring child protection cases, advocating for the protection of children, and disseminating information to their respective schools and offices. On behalf of the Department, Undersecretary for Legal Affairs Alberto Muyot received the manuals officially turned over by Consuelo Zobel Alger Foundation’s Managing Director, Atty. Carmela Andal-Castro. Castro also expressed her hopes that the publication of the CPS training manual would help teachers, school officials, and even parents combat abuse, neglect, and exploitation of learners. The training course manual contains the training program, materials for the training modules, and the references used such as the DepEd Order No. 40, s. 2012 or the DepEd Child Protection Policy and the Republic Act 7610 or the Special Protection of Children Against Abuse, Exploitation, and Discrimination Act. Pursuant to Department Order No. 131, s. 2016, and to further boost the implementation of its policies on child protection, DepEd shall train and designate CPS who will provide technical guidance to the schools and their respective schools divisions on complex or serious cases of child abuse brought to their attention, and recommend actions to address the same based on existing Child Protection-related laws and pertinent DepEd issuances. The CPS shall also assist in referring cases to concerned government, non-government, or other agencies for appropriate interventions or further case management. There are two levels of training for CPS: (1) National Training of Trainers on Child Protection; and (2) Child Protection Specialist Training. To date, there are 290 trained and designated CPSs in Regions 1, 3, 4A, 4B, 5, 6, 7, 8, Cordillera Administrative Region (CAR), and National Capital Region (NCR). There will be additional three batches for the Second Level Training in February and March, with participants from Regions 2, 9, 10, 11, 12, and 13. “We hope that this training course can adequately address the needs of our child protection specialists. It is our goal to train individuals to be knowledgeable on the holistic approaches to child protection,” Muyot concluded.